Santec is one of the leading engineering and manufacturing companies, which provides a wide range of hydraulic presses and automated systems in various capacities ranging from 5 tons to 5000 tons. It utilizes proven and standard designs that is tailored to the customers' specific applications. These presses can be made for any industry with different capabilities and options. All the presses feature latest hydraulic control technologies. The hydraulic presses are available in specifications like straight side end-frame, C-frame, bench top or gap frame configurations. 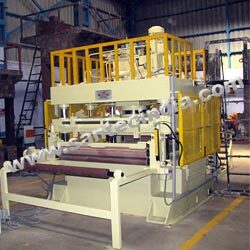 The advantages, that a hydraulic press have over mechanical presses, are being realized by today's manufacturers. Having unlimited capability, modern hydraulic presses provide performance and reliability in almost all applications such as stamping, punching, blanking, drawing, bending, etc. The designs and circuits of the hydraulic presses can be suitably configured to match the most non-standard requirements. The hydraulic presses can be either fully automatic with PLC control or they can be contactors/relay based.